In our Post 16 unit we are very fortunate to have a range of superb students from other countries, who join us to study A level subjects for either one or two years. 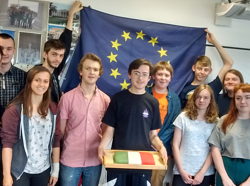 This year Andrea Paone joined us from Italy to study History and English. As with other students, such as Arian and Mai from Germany, Andrea has thoroughly enjoyed his time at Clyst Vale Community College. Our Post 16 students have made these students welcome and we have all benefitted from meeting them. We are always sad to say goodbye to these new friends and shared a cake with Andrea in our final History lesson to say farewell.